Check out what we learned this week. We're following the ABC Jesus Loves Me Two Year Old curriculum. This week we continued learning about how God made the world around us. We read about God creating the land and the plants on the third day. We read from The Beginner's Bible pages 9-12. We continued our Creation Day Book by making Day 3. We glued brown and green construction paper to make trees and plants, and Anna painted the water blue. We planted poppy seeds, sunflower seeds, and cilantro seeds and talked about how plants need sun, water, air, and dirt to grow. We've been watering our plants everyday. 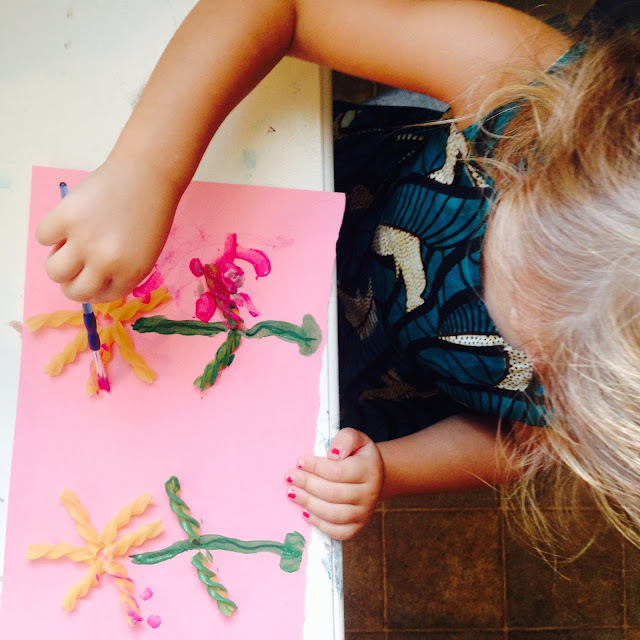 I glued uncooked curly pasta to construction paper to look like flowers and had Anna paint on the pasta. We're continuing to recite our creation fingerplay and have added "On Day 3, God created the land and the plants". I'm realizing if it's not with music it's harder for her to remember but if it is to music girl's got it down! So everything we're learning we're putting a beat behind it. Starting to paint her water that turned into a snake. On Day 3 God created land and plants--and according to Anna, snakes. 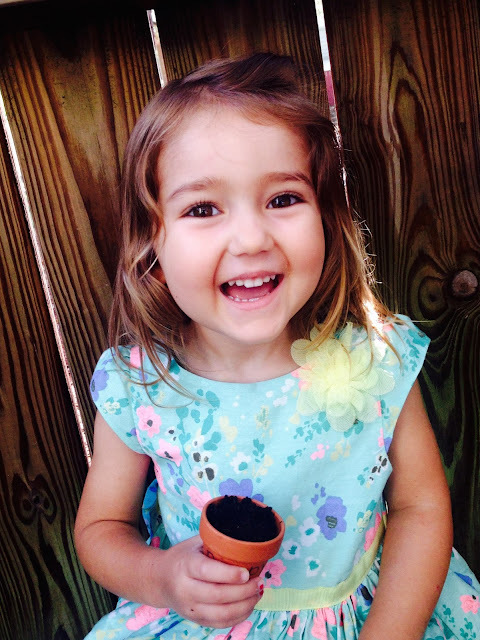 My little flower girl planting her first flowers. Verse: Genesis 1:1-In the beginning, God created the heavens and the earth. Same verse as last week. I love that she's already memorized a Bible verse! When I first introduced this song I was surprised to hear her pick it up so quickly. I asked if she'd ever heard that song before and she exclaimed "yes, at church!". We sing it together before we read our Bible story. We started the week with a color walk where we looked for blue objects. Anna found blue trash dumpsters, blue letters on license plates, blue cars, and my blue shirt. Anna knows her colors really well. This week it got to the point where I'd ask her to find the color blue somewhere and she'd just say "no". Stubborn much? We continued reciting Anna's full name plus Mommy, Daddy, and Theo's full names. Self Care and Manners: Say "Please"
Anna knows "please" really well. She knows that if she whines and doesn't say "please" we won't listen to it. However, this is something she definitely still needs to work on. I'm trying to get better at saying "Anna, I will be happy to listen to you when you say "please" first and in a big girl voice." We counted to 1 on our button counting card. I love how every time I ask how many buttons there are she says "just 1". She knows the number 1, she knows how to count to 1, and she knows how to find 1 object. Bring on the number 2! We made lines, er snakes ;) out of play dough. We put Anna's wooden blocks in a line. I drew vertical lines on a piece of paper using a highlighter. On one end of the line I added a green dot and the other I added a red dot. Then Anna traced each line starting at the green dot down to the red dot (this is prewriting activity). I glued uncooked spaghetti to a piece of paper and had Anna use blue (color the week) paint to trace down the spaghetti. We would read this book in the morning, before nap, and at bedtime. It was an easy book for Anna to read along (recite) since there weren't a lot of sentences. We also made an elephant mask one day using a paper plate, cardstock paper, and paint. We didn't have gray paint so I mixed blue, brown, and white. I wasn't sure if it'd come out gray but I'd say I did a pretty good job guessing! After borrowing this sorting toy from a friend I quickly realized that Anna has already got this motor skill down. 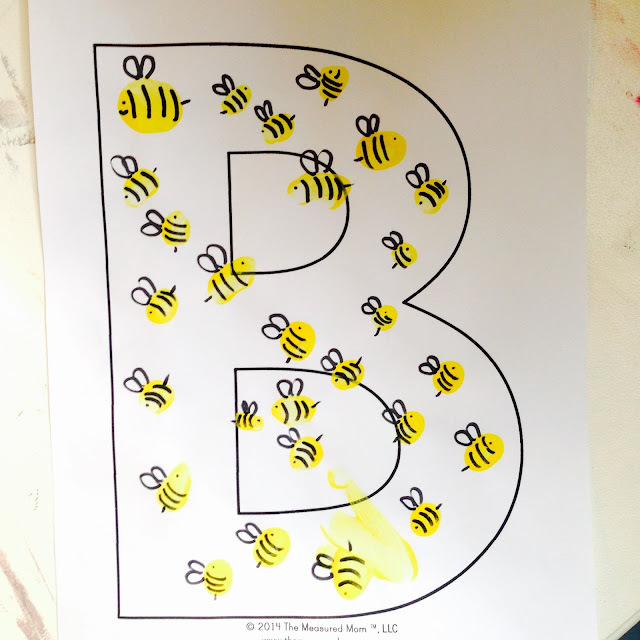 She still enjoyed it but I wanted to give her more of a challenge so I switched our activity to one I found from a friend's blog (Katie's Chasing Vowels). I love that it's super simple to set up and with items we already had around the house (pipe cleaner, beads, and paper). The child strings the appropriate amount of beads onto each pipe cleaner. It was great for counting and for fine motor skills. 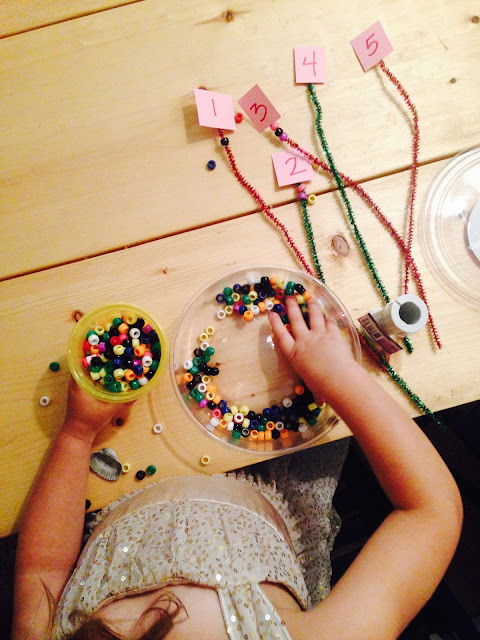 It turned into Anna pouring the beads into a cup and less about the counting and stringing. While I played music each morning Anna worked on jumping like a frog, kangaroo, and "runny babbit"--she said this one day on accident and thought it was the funniest thing so we've continued calling it that. I love how she cracks herself up because she sure cracks me up!